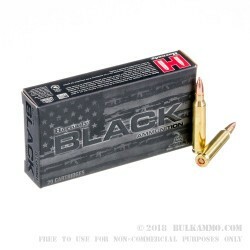 Hornady BLACK is a line of product that is custom made and tuned for use in “America’s favorite rifles. 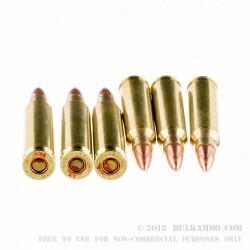 A 62 grain FMJ projectile with a brass boxer primed case and a high level of quality control, this 5.56x45 ammo is suitable for any AR-15 and has excellent performance and reliability. Sure, there is probably a healthy dose of marketing that plays a role with the Hornady BLACK ammunition, but are you going to challenge Hornady’s claims for performance when they have proven time and time again that they are as good as it gets? Hornady simply produces components and ammunition that works, reliably, accurately and with excellent end results. Their BLACK rounds come off the same production lines and utilize the same engineering and components. That means something: Hornady is credible and they deliver results on paper, in tactical situations and have done so for a very long time. So marketing hype and a new cardboard box or not: you’re not losing anything by choosing Hornady first. 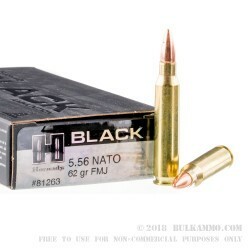 Hornady BLACK 5.56x45 comes out the barrel at 3060 fps and is pushing 1291 ft. lbs. of energy at exit; and is priced moderately for the reliability and performance Hornady is known for. 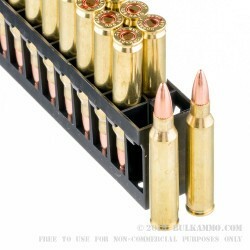 It’s premium grade target ammunition and suitable for varmint work in the field. Cool looking box or not: this is legitimate ammunition made by one of the best producers in the game.